As I watch "Boo" learn to walk, I am reminded of my walk with Christ. Sometimes I stumble or even fall, but each morning I wake up and try again. God sends people along the way to help me, just as "M" quickly comes to "Boo's" aid. I am so thankful for all the people that have encouraged me and cheered for me along the way, and pray that God will continue to light the way. a light on my path." in the light of life." Last night the girls were playing around my feet as I cooked dinner. "Boo" has just started walking and they were sort of playing "chase" or "tag". I told "M" to be careful that she did not knock sissy over because she was still learning. "I play with sissy and I fall and hurt my chin. Mommy stop cooking. I hold washcloth on my boo boo. Mommy drive to doctor and he fix my chin. Aunt T come and sissy go play with Aunt T. I was brave and got stickers. Mommy put medicine on my chin and it all better." She may have 3 stitches, but it's certainly not slowing her down! 1. For moving Aunt T and Uncle J to the area. What a blessing to have family around! 2. That it was only a few stitches - no big deal in the big scheme of things! 3. For helping me to remember to turn off the stove before leaving the house. 4. For all of the doctors and the wonderful staff at the Children's Hospital. 5. For giving "M" (and Mommy) strength and courage. 6. That hubby called while we were at the hospital. It's always encouraging to hear his voice and he was able to calm his little girl. We are moving out of the bug unit and into our garden unit (although the bugs can be found in the garden!). I've been working all week on getting our shelves ready (pics next week of tools and toys). Made "E's" using cookie cutters and by connecting "moon sand worms"
"M" signing the letter "E"
Cut the letter "E" out of construction paper. Glue earthworm to the letter "E". Cover the "E" with glue and spread ground black beans over it. It will look like the earthworm is popping up out of the earth. I'm not sure where I got this craft idea from, but the kids loved it! Paint straw brown (or use a brown straw if you can find one). Trace and cut out child's handprints from the green construction paper. Poke hole in bottom of cup (large enough for the straw to fit through). Glue handprints to the cup (to resemble grass). Glue googly eyes to the straw. Place straw through hole in cup. Enjoy playing peek-a-boo with your earthworm! I have two dessert recipes for you this week. This first one I am going to share was inspired by an ant infestation we experienced this weekend. What do ants have to do with peppermint brownies? I'll explain. I woke up to find ants pouring into the house (I think they were argentine ants... small, black, and bite!). I found them in every cabinet and drawer in the kitchen. By the end of the morning I had completely emptied out my kitchen, washed every dish, and done lots of research on getting rid of ants. One of the recommendations was peppermint oil. It worked really well (or seemed to at first). I applied it all around the light switch and the ants immediately left. The only problem was they then started coming in under the dishwasher. So I put peppermint oil there. They again left, but this time came up behind the sink. I decided I could chase them all day this way and they'd still find a point of entry, so a sweet friend brought over some Terro Liquid Ant Bait. Worked awesome!!! By the end of the afternoon I had a clean and very peppermint smelling kitchen, which made me crave peppermint brownies. This recipe is from ENJOY LIFE'S Cookies for Everyone. They are a little dry, but it could be from some of the substitutions that I made. The flavor is good though and they would be excellent with some ice cream or whip cream. The recipe in the book also has a frosting, which would probably make them better too. *In a large saucepan, combine applesauce, oil, sugar, salt, chocolate chips, vanilla, cocoa, water, and peppermint. Over low heat, stir constantly until chocolate chips are melted. Remove from heat. *Stir in remaining ingredients. Pour batter into greased 9x13 inch baking pan. *Bake for 25 minutes, or until slightly soft in the center and firmer around the edges. Let cool completely. You would never think that these are made from white (I used navy) beans!!! I made these for a playgroup at our house and everyone was very skeptical when I told them the ingredients, but everyone left asking for a copy of the recipe! They are very moist and incredibly delicious!!! 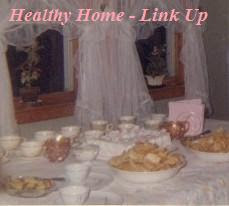 I found this recipe through the Legacy of Home Healthy Home Link-Up. Linda's Lunacy linked up and it led you to Modern Alternative Mama. I made them into cupcakes. You can probably half the recipe pretty easily, but they were such a big hit that we went through all the cupcakes by the end of the afternoon. Add all ingredients to a blender and blend on medium, then high until smooth. Pour into two well-greased 9" pans and bake at 350 for 35 - 40 min. (For making cupcakes, bake approx. 18 minutes.) Once cooled, remove from the pans carefully and serve plain, with fresh jam (fruit blended with honey), fresh fruit, or however you like! When you're done with the desserts, get outside and burn some calories! 1. Take advantage of the long summer, sunny days. Use your blinds/curtains! I now rarely use lights. In fact, days can go by before I turn on a light. The girls wake up with the sun and are asleep before it gets too dark out. When it gets so dark that I cannot see, I take the hint and go to bed! It did take me a little bit of retraining to walk over and open the blinds when I walk into a room rather than to reach for the light switch (and to remember to close the blinds when I leave a room to keep the sun from heating up the room), but why pay for light when the sun gives us plenty of it on most days. 2. Hang your laundry to dry. This is quite possibly my favorite change, for I just love when I can be productive while the girls play. "M" will either help me, splash in her pool, or run through the sprinkler and "Boo" will happily swing while I work. Everyone's happy! 3. Turn the thermostat up. We used to keep the house at 78 degrees during the day, and 76 degrees at night. Well we got a letter from our eletric company with a statistic (which I forget what it is now) about how much money you save per degree you turn up your thermostat. So I changed to to 79 degrees during the day and 77 at night. Then it sort of turned into a game to see how high I could set it and how much money we could save. Now we set it to 82 degrees at the lowest during the day (sometime as high as 85) and 78 at night. It is amazing how your body adapts and now 84 degrees is often a comfortable temperature (unless I am doing heavy housework or running around with the kids and then I'll lower it to 82). I have found that the girls do not sleep as well at night if it is warmer than 78 degrees at night. Amazing things happen just by going outside. For starters, you are not running electronics like the TV or computer. Second, your body adjusts to much warmer temperature so when you come inside, 85 degrees feels cold! Plus, it is healthy to get outdoors, soak up some Vitamin D, relax, run around, and have fun! We took a week to review our Letters A, B, C, and D and to do some fun bug activities that we did not get to in the past couple of weeks. I surprised "M" with these Rag Quilt Letters. She had so much fun hanging them on the rope with her "pretty" clothespins. Now I need to get busy making the rest of the alphabet!!! I saw this somewhere and cannot remember where or find it again, so if you blogged about this craft before please leave a comment giving yourself credit! We have had a whole bunch of balls from our ball pit split in half. I have been saving them trying to think of a way to reuse them, and finally came up with this craft. I cut a hole in the center of each half so they could be strung on a rope. I then cut up toilet paper rolls (into approx. 1/2 inch circles) to use as spacers. They alternated stringing a ball half and spacers until their caterpillar reached the length they wanted, and then I tied in the rope to finish it off. These caterpillars have provided for hours of fun. "Boo" even has her own little caterpillar. We've been trying out lots of new recipes this week! We've been trying to incorporate more raw vegetables into our diet, and are also trying t﻿o make everything from scratch. Gluten free "foods in a box" are so expensive and really are not all that nutritious (not that the ones that I made are totally healthy, but it is a step in the right direction). I found this recipe on the Marine Corps Nomads Blog. WOW! Flavor is awesome. I definitely need to bake it about 10 minutes longer next time, but they were oh so very delicious. I used mostly organic ingredients and raw cheddar cheese. I blended it in a VitaMix which worked incredibly well. Place all ingredients in blender. Blend until completely combined. This will be thin batter. Pour mixture in prepared mini muffin tins. Reduce oven temp to 350 degrees F.
Bake for 25 – 30 minutes until slightly golden. Remove from pan. Serve immediately or cool and store in airtight container. I was trying to find something to do with our green beans we got from the Farmer's Market this weekend. We normally just cook them up in some olive oil and garlic, but as I said earlier, we are trying to incorporate more raw veggies into our diet. "M" will just eat raw green beans plain, but I need some more flavor. So in a bowl I mixed the following ingredients (and I just threw it together without measuring, so you might have to adjust according to your taste preferences) and allowed it to marinate in the refrigerator for an hour (but I have to say that they more much better as leftovers the following day when they had been marinating for 24 hours). For lunch I will often serve "M" a muffin tray of veggies. You can see the Raw Green Bean Salad in the upper right. This particular lunch tray also has Kale Crisps, Bell Peppers, and Cucumbers. I made some changes to the recipe, so I will write it as I made it below. 2. Pace all ingredients into VitaMix (or blender) for 2 minutes. 3. Pour into greased 9-inch pie pan. 5. Let cool. Slice into wedges. While we were waiting for this to bake, "M" did some baking of her own! I love to run! In fact, I just love working out in general. It is how I de-stress and have some "me" time (even though the kiddos are usually right in front of me in the jogging stroller). It allows me to clear my mind, to think, and to pray. It makes me feel good (love those endorphins!) and energizes me. ﻿About 6 weeks ago I completed my first triathlon! Well, I have trouble finding time to train for something that big all the time, but I do enjoy running 5K's here and there on the weekend. 5K's are perfect because they are short enough that I can train for them with my children (3 miles is about their limit for being able to sit still in the jogging stroller. After that they usually start pulling each others hair or get very cranky and it causes more stress for me than it relieves!). I recently recruited my sister-in-law and nephew to start running these with me too! They are fun, family events and a healthy way for us to spend the day. Most of the time I head straight from the race to the Farmer's Market - what a great way to start the weekend! "M" loves being chased through the fields by Uncle "J". She also found a stick and a puddle of water, which made for one happy little girl! "Boo's" favorite part is the food and playing with Mommy's medal. We went on a walk around our house exploring all the bugs, and guess what we found?!? DRAGONFLIES!!! The weather has been HOT but BEAUTIFUL! We spent a great deal of time outside this week, so we decided to color some dragonflies on the driveway. I cut the letter "D" out of construction paper for "M" to color. Then she used different sized popsicle sticks (one large, and two smaller one), a pom pom, and wiggly eyes to make a dragonfly to glue on it. "Boo" is starting to join in on more of our tot school time, and when we were finished and I went off into the kitchen to get lunch ready I could hear "M" playing teacher to "Boo". She held up her craft to "Boo" and asked, "What letter is this, sissy?" "Boo" did not say anything, but "M" still replied, "'B'? No, silly, it's a 'D'!" I thought it was way cute! Then she was taking "Boo's" fingers and showing her how to sign the letter "D". I loved this craft because stringing beads is an excellent fine motor activity. We used three pipe cleaners (One for the body and one for each set of wings). For the wings we strung on red beads. The rest was just a matter of twisting it together to look like a dragonfly. "M" was so funny with this because she would get more and more excited as she put more beads on the pipe cleaner. Then we built and played with a dragonfly made with Legos. I continue to fail to get any good pictures of this, but we are still using 1+1+1=1 Pretty Bugs Preschool Pack. "M" loves the "Bugs, Bugs, Bugs" song and I constantly catch her singing it as she's playing. Weekends are for singing to the LORD!